Valentine’s Day is quickly approaching! How do you celebrate this fun holiday with your family? Do you plan a family date night? Leave a heart-shaped box of chocolates on your child’s pillow? Leave little love notes around the house? Or do you plan a fun family party? 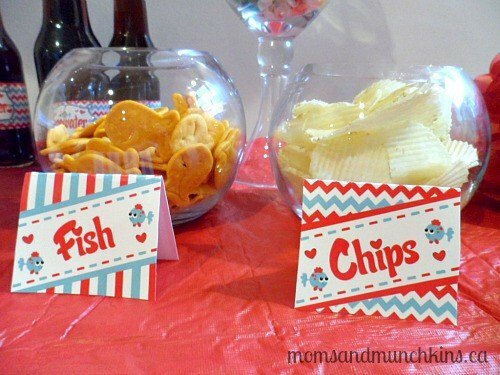 These fun Valentine’s Day party for kids ideas all revolve around a fun fish theme. 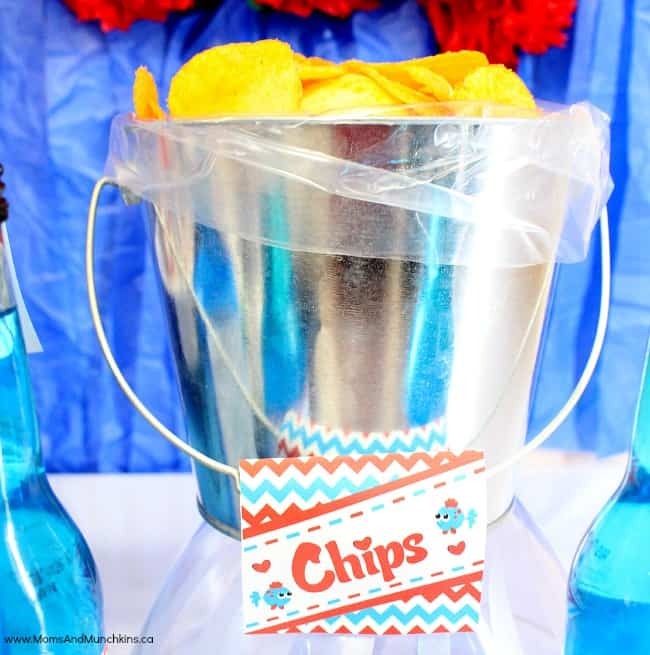 Setting up this party is so easy with these printable party supplies from Just a Little Sparkle and some accessories that you can find at your local grocery store and dollar store. A red or blue tablecloth would work for this party theme. A fun addition would be red and blue paper lanterns above the table. You could also create red or blue tissue pouf balls (here’s a tutorial) for additional table decor. For this party, I did a candy and snack buffet. There are so many fun fish-themed ideas! Here are a few ideas I used in the party plus a few extras that would be a delicious addition. 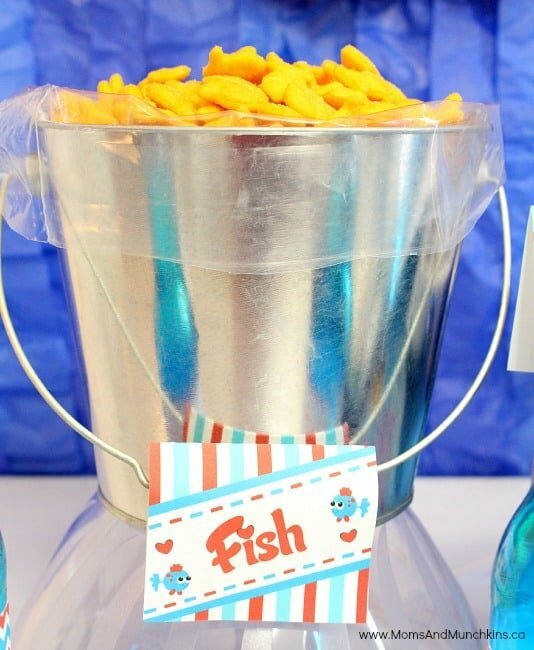 Fish & Chips: Goldfish crackers and potato chips in fish bowls are tasty snacks that most kids enjoy. Actually, after I was done with my party pictures, my husband sat on the couch with the two fish bowls to eat the snacks during the football game. See…a perfect snack food for all ages! If you are looking for more of a meal than a snack, you could also serve fried fish sticks with french fries. 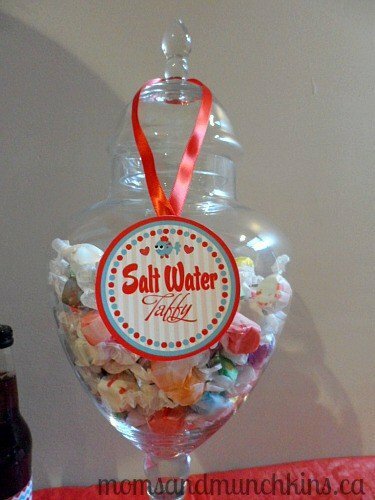 Salt Water Taffy: These candies can be placed inside a large candy vase. 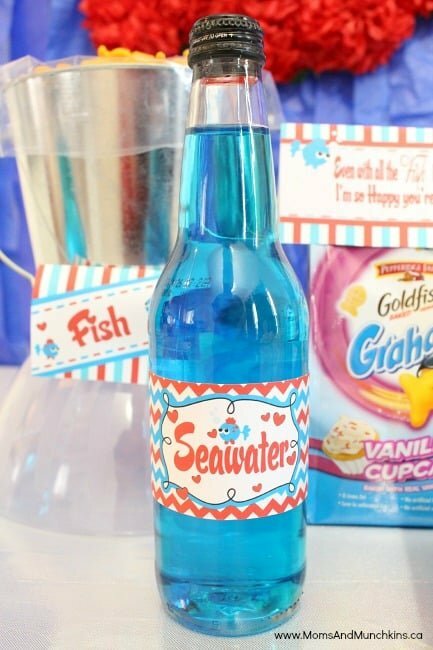 Seawater: Bottles of blue pop could be labeled as “seawater”. 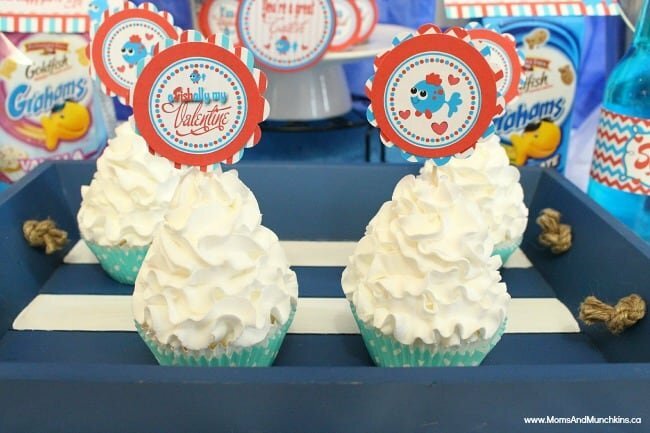 Cupcakes: A party just wouldn’t be a party without icing! 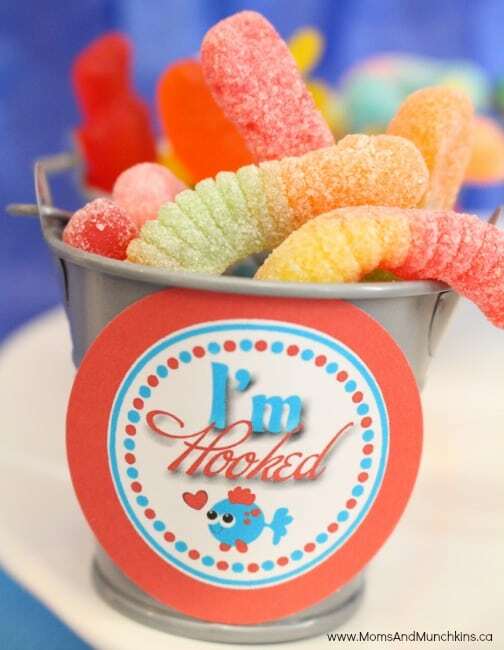 Here are some cute ideas for cupcake toppers with phrases like “oFISHally my Valentine” and “I’m Hooked”. 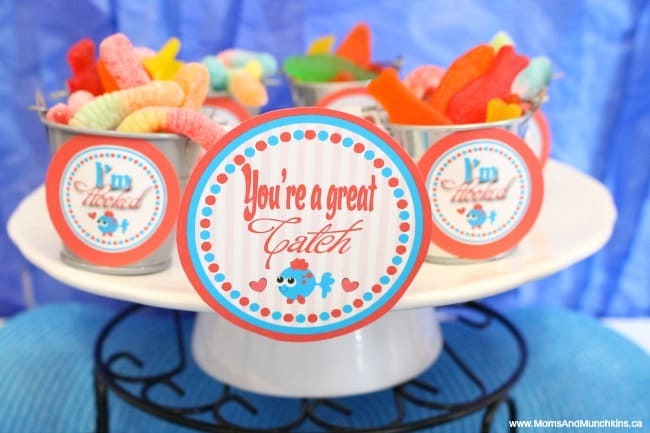 Every party needs a fun game and a Valentine’s Day party for kids is no exception. 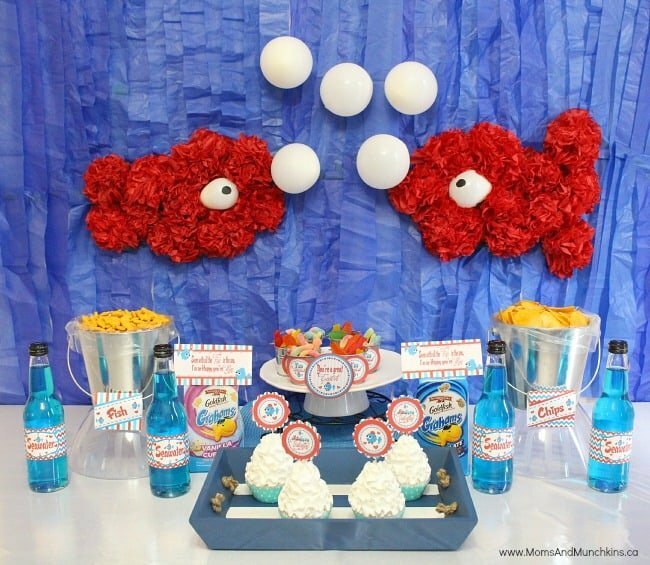 What better idea for a fish-themed party than a fishing game! You can find all of the supplies you need for this game at your local dollar store. 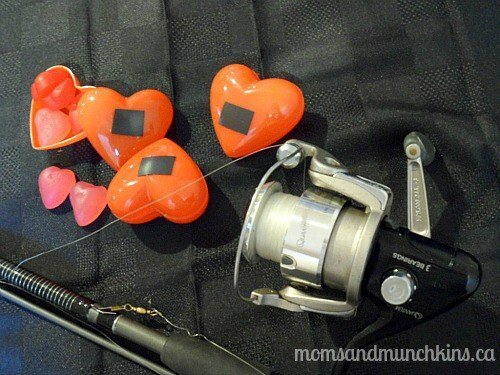 Simply purchase plastic heart containers, a magnet sticker sheet, a magnetic toy fishing rod and some Valentine’s candy. You can place a small strip of magnet on each plastic heart filled with candy. 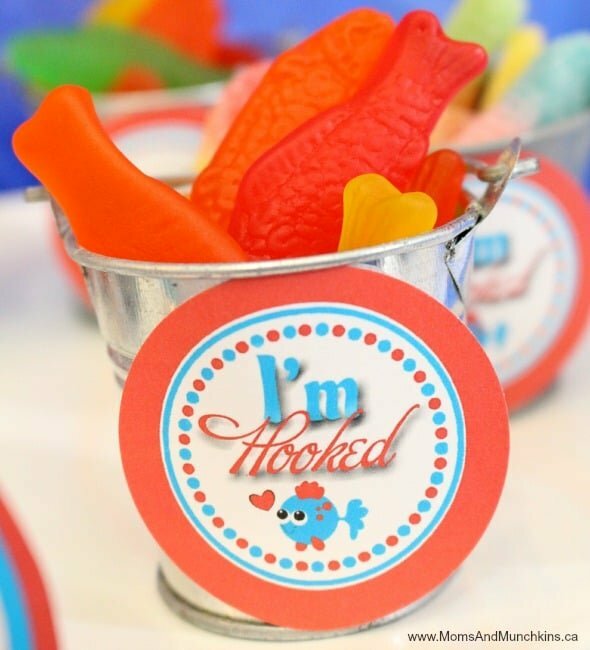 Kids then have to use the magnetic fishing rod to catch themselves a Valentine’s Day treat! It’s always nice to send guests home with a party favor to thank them for celebrating with you. 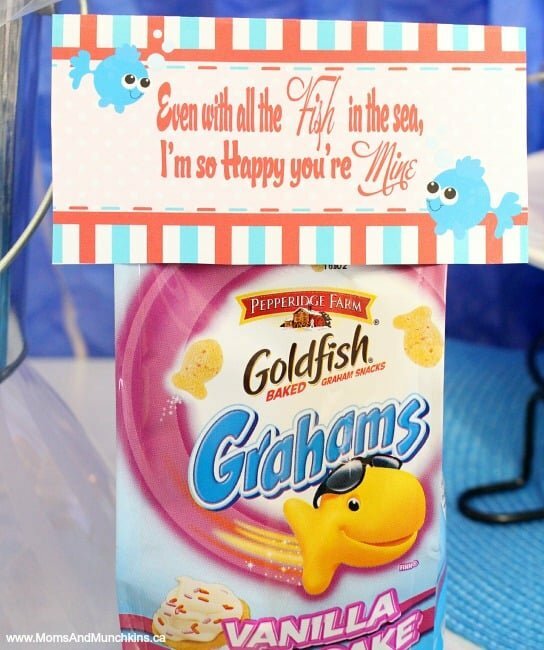 Here are some fun Valentine’s Day party for kids favor ideas for this fun fish theme. 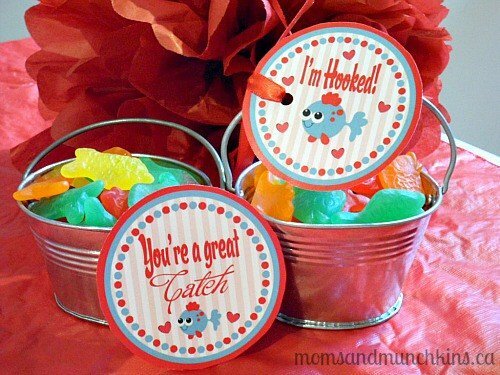 Small metal pails can be used for fish gummies along with a “You’re a Great Catch” or “I’m Hooked” favor tags. 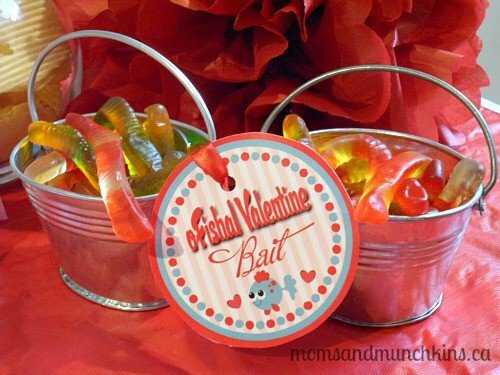 A fun alternative is to use gummy worms with an “oFISHal Valentine Bait” tag. 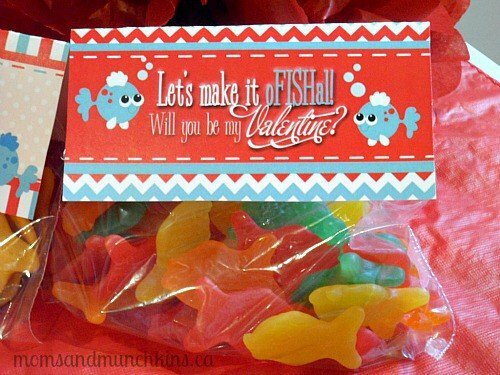 An alternative to gummy fish is to use Goldfish Crackers. There are so many different flavors of Goldfish Crackers that you can mix and match some of the different types. Funny story – I purchased a box of Goldfish Crackers this weekend that said “Giant” on it. I thought it meant it was a giant box as opposed to the smaller bags of crackers for sale. When I opened the box at home I realized that the fish themselves are giant, not just the box! So, you could mix some small crackers in with the giant ones. 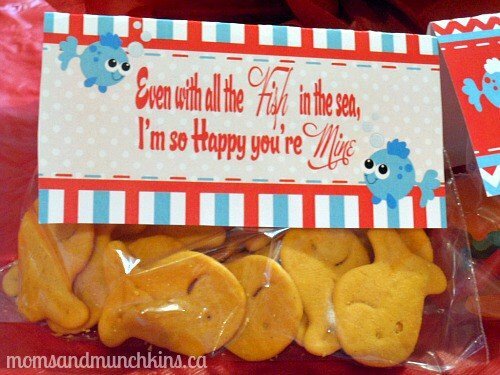 Fun wording for the favor bag toppers includes “Even with all the fish in the sea, I’m so happy you’re mine” and “Let’s make it oFISHal! Will you be my Valentine?”. 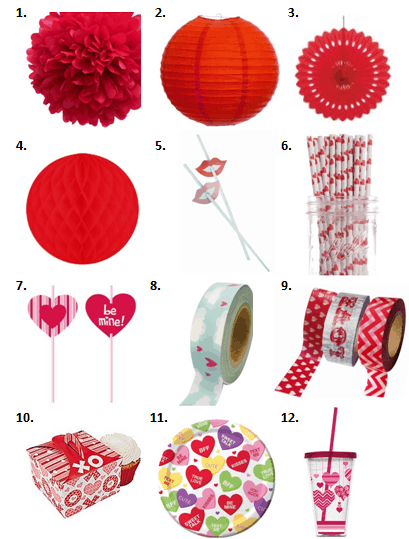 Visit our Valentine’s Day Fun page for more party ideas, sweet treats, free printables and more! When is the last time you attended a Valentine’s Day party? We’re always adding new ideas for holiday celebrations so follow us on Facebook, Twitter, Pinterest and Bloglovin’ to stay updated on the latest ideas. Disclosure: Just a Little Sparkle kindly provided me these party printables free of charge. I am part of the Amazon affiliate program. All opinions expressed here are 100% my own. Those printables are ADORABLE! 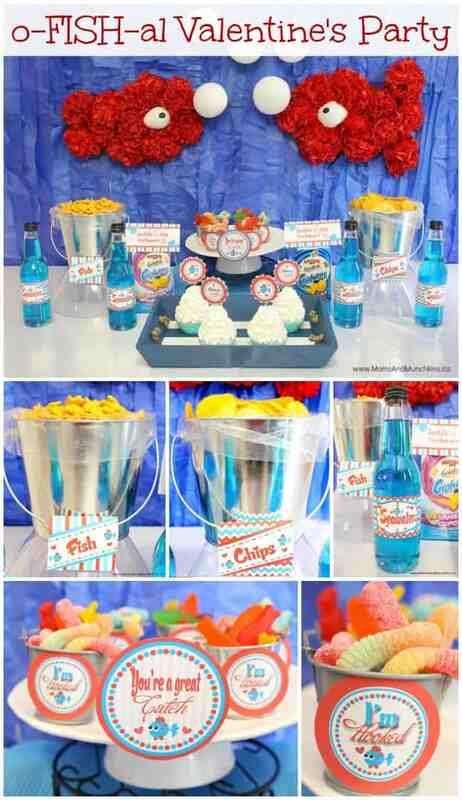 What a cute party theme idea! I live your brilliant creative ideas. Love them. The printables are amazing and adorable. You should be a party planner. Aww…that’s so sweet of you to say, Paula. Thanks! so cute!! Thanks for sharing! I think this would be great for a Nemo theme, too. Thanks, Jody! Yes, Alyssa has really cute supplies.